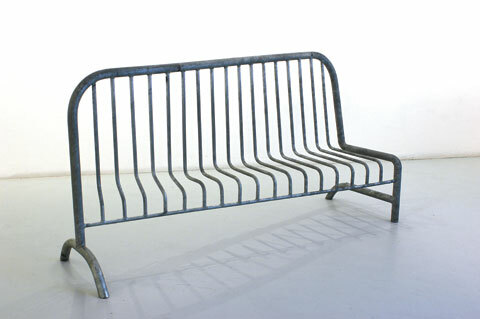 Philippe Million’s Barrier Bench, 2002, turns a steel barricade into a place for sitting. 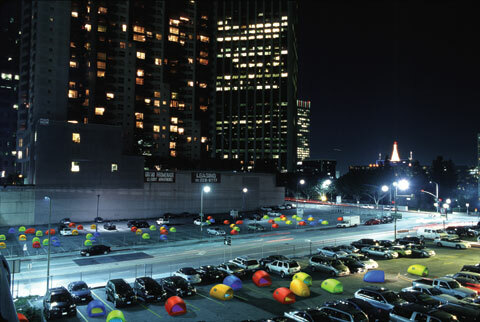 Cameron McNall and Damon Seeley of Electroland designed an inflatable homeless shelter (below) that can be deployed in parking lots and open spaces. 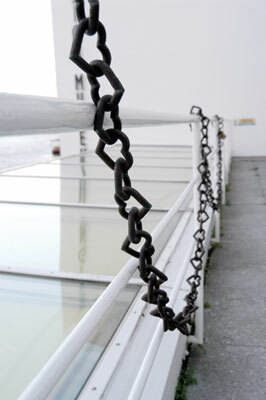 Matthias Megyeri’s 2004 Heart to Heart chain (below) adds a sweeter side to security. SAFE: Design Takes on Risk is the Museum of Modern Art’s first major design exhibition since its return to Manhattan last November. Curated by Paola Antonelli, the exhibition features more than 300 contemporary design objects and prototypes from all over the world that have been created in response to dangers, risks, and stresses that range in severity from the displacement of whole populations from genocide or natural catastrophes all the way to protections from the humble paper cut and blister. The objects are presented without passing judgment,, as the show’s curator Paola Antonelli put it. We just show how designers can offer grace in emergency situations and times of revolution and turmoillboth historic and domestic. Design can make a difference in how people manage the situation of emergency,, she said. With characteristic acuity, Antonelli has chosen for her first big show since Workspheres (2001) a poignant themeeone that is bound to resonate with the public, especially in the current climate of fear and anxiety. Interestingly, the show was conceived well before 9/11. At that time the exhibition was framed around the idea of emergencyy and consisted of ambulances and emergency- response equipment and tools. Focusing on such prosaic expressions of design is part of Antonelli’s larger mission as a design curator to open people’s eyes to the beauty in the everyday and to the things they hadn’t previously considered as being part of the design canon. Medical instruments are to designers and people who love design what radio towers are to architects,, said Antonelli. There’s this bare-bones beauty, where the function and the engineering skeleton are exposed, that is very meaningful and arresting.. When a very real national emergency struck in the shape of 9/11, Antonelli shelved her exhibition. It was only to resurface when she, Hella Jongerius, and Gregg Pasquarelli chose the theme of safety for the 2003 edition of the Aspen conference that they were charged with organizing. Considering the subject of emergency from the new perspective of safety, and looking at design’s role in providing comfort and a sense of security, made the exhibition’s premise viable again for the curator. The objects are organized into thematic groupings that reference either the reason for their creation or the type of solace and protection they are meant to provide. The section titled Shelter,, for example, features temporary housing for refugees and disaster victims along with examples of psychological protection against anxiety and stress. Among the exhibits, for example, is Shigeru Ban’s shelter designed on the occasion of the Kobe earthquake in 1995 and made out of easily found cardboard tubes, beer crates (or in the case of Muslim countries milk or soda crates), and plastic tarps. The tarp is the beginning of a shelter,, said Antonelli, but the addition of a door can give a displaced person a sense of home and not simply a roof over their head.. This is the difference that design can make. Michael Rakowitz’s paraSITE homeless shelter is made from Polyethylene and designed to plug into the outtake ducts of a building’s HVAC system. The warm air leaving the building simultaneously inflates and heats the double membrane structure, protecting a homeless person from heat in the summer and cold in the winter. 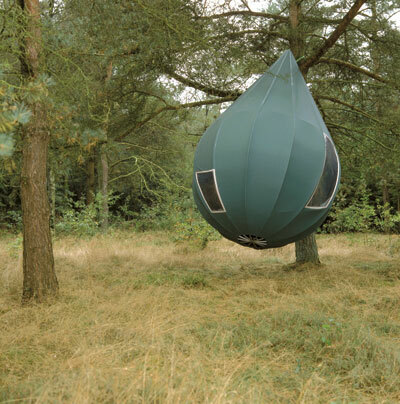 Also included in this section are psychological shelters such as a felt cocoon called Cries and Whispers created by Scottish designer Hill Jephson Robb when his sister died of cancer leaving behind a seven-month- old daughter in need of a womb- or nest-like structure in which to seek refuge. Another grouping in the show, titled Armor,, features objects designed to protect the body and mind. Included here is Suited for Subversion, the ingenious invention of South African interactive designer Ralph Borland. It’s a suit for a protester to wear that inflates when he or she is threatened. The suit is fitted with a camera to document any encounters with the police and a speaker that amplifies the heartbeat to remind the police of their humanity. When gathered in a crowd with other suits, the simultaneous beating creates a dramatic and powerful rhythm. Such innovative and quirky interpretations of the idea of armor enliven more prosaic examples of the genre such as earplugs, welding helmets, and other examples of industrial protective gear, that receive short shrift in the exhibition’s press materials. Despite this apparent predilection for the poetic, Antonelli asserted that, Beauty and usefulness alone were not enough to justify inclusion in this exhibition.. Her criteria stipulated that each object had to transcend the outcome of the equation of its form and function by displaying meaninggto an individual, to a community, to the world at large and, last but not least, ingenious beauty..
Safeguarding property is another issue that many designers and architects have addressed through their products and prototypes. The KOL/MAC Studio has created INVERSAbrane, a concept for an invertible membrane that protects buildings from the elements and other forms of attack. The membrane, made from vacuum-formed DuPont Corian and Sentry impact-resistant glass, is designed with excess surface area that acts as a defensive yet proactive barrier between the elements and the structure it defends. The membrane circulates air, filtering out pollutants and other allergens. Its bladders collect rainwater for daily use as well as for sprinkler action; the surfaces use solar energy to regulate humidity and temperature both inside and out, and it incorporates fire-resistant and thermoactive textiles. In the domestic sphere is Sweet Dreams Security, Matthias Megyeri’s series of safety products that wryly comment both on heightened fears associated with home security and the cult of cute. His barbed wire is woven with fierce butterflies and fish, his iron railings have bunny rabbit shaped posts, and his heart-shaped ring chains are fastened with teddy bear padlocks. The work, which was undertaken while Megyeri was a student at the Royal College of Art in London, addresses the often-contradictory needs for protection and beauty. Left: Drr Wapenaar’s Treetent, 1998, can be fastened to a tree. 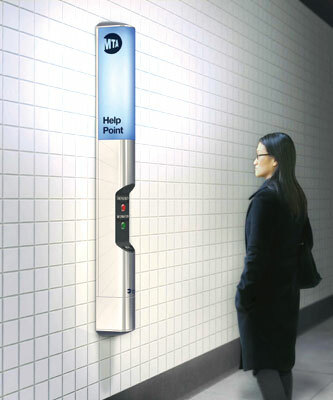 The public realm, too, is addressed with the inclusion of Help Point Intercom, recently created by Antenna Design for the New York City Subway. Part of the section called Awareness,, which examines how clarity of information can provide a measure of safety, the intercom system is intended to aid in relaying travel and emergency information between riders and security personnel, while being resistant to vandalism. A design exhibition at MoMA is clearly going to be about objects. Designers like Bruce Mau have argued, however, that design is increasingly being understood in a wider and more fundamental sense as the capacity to plan and produce desired outcomes. There are some important aspects to the story of safety that, while they are not always easily expressed through tangible forms, would have added an interesting extra dimension to the exhibition. In addition to creating the kinds of beautiful and useful band-aids that this exhibition documents, design is also putting its brains and brawn to the task of changing the policies and attitudes that engender fear and disaster in the first place. Blue LEDs in Antenna Design’s subway intercom convey security without intruding on one’s commute. Design and design thinking can be used to persuade government, industry, and the consuming public to claim responsibility for and to begin to redress global ailments such as climate change, health crises, violence, terrorism. Such dialogue between policymakers and designers would at the very least prevent such false assurances as the inept color-coded Homeland Security Advisory System. Design can also be used to create powerful but invisible things like networks, infrastructures, and systems that are all instrumental in the prevention of and recovery from disaster. In addition to the many potent objects in the exhibition, evidence of these new directions and applications would have provided a welcome supplement. Alice Twemlow is a design writer based in New York City.